On the most northern tip of Wyse Road in Dartmouth, there stands a little breakfast house. Their sign says, “Breakfast served all day!” The food is great, but it’s struggling to stay alive in the small Dartmouth neighbourhood. When you go inside Nena’s Breakfast House, you get a friendly smile from waitress Hillary Manchester who tells you to feel free to sit anywhere. She finishes filling a family’s coffee mugs and then brings over a menu. There’s a lot of optimism about Dartmouth entrepreneurs in the food scene these days. In the southwest hub near Portland Street and Alderney Landing you have Two If By Sea and The Canteen. Long-time favourite Ma Belle’s is just down the street. The Alderney Farmer’s market is always busy on weekends and musician Joel Plaskett just opened up his new café/barbershop/record store a few blocks over. North-end Dartmouth, a five-minute drive up the road is another story. Nena’s opened in 2013. There’s a few other businesses on the block. Next door is the neighbourhood convenience store/video rental/laundromat. It’s a warm and cozy neighbourhood restaurant. All the reviews on Facebook are 5/5 stars. Another favourite is their affordable add-on menu. “Some people do a breakfast of just add-ons,” says Head Chef Ryan Veinotte. “They can combine them however they like.” The possibility of fries with gravy and bacon, or eggs how you like them with a side of toast smiles down at you from the sunny yellow wall menu above the cash. Veinotte started here in June. He says he loves where they are. That’s great for fostering relationships with diners, but Veinotte says Wyse Road is out of the way for some people. It’s hard when foot traffic is slow. North-end Dartmouth is trying to change the way people look at it. “Between the Bridges” is a new community development model for north-end Dartmouth that started in March. It aims to support “the strength and aspirations of our neighbourhood.” However, its first endeavours are focused on youth education, and the process is slow going. Veinotte doesn’t want to see this place die. He moved here from Lunenburg and has been “cooking up a storm” ever since he arrived. He shows me the cinnamon rolls and chocolate cake on display by the cash. Everything is homemade. Veinotte gives me a free cinnamon roll. It’s crumbly and soft, like a scone. It doesn’t last long. A family in a BMW pulls in and quickly finds a table. BMWs are a rare sight in this part of town. A father with three children walks in from across the street and his kids entertain themselves with the menu. A solo regular sips his coffee slowly, staring out the window. Manchester greets him by name and they chat for a bit. Veinotte just hopes they can keep this place alive. He admits he’s a bit of a Luddite. They have a Facebook page and a website, but they don’t get updated much. 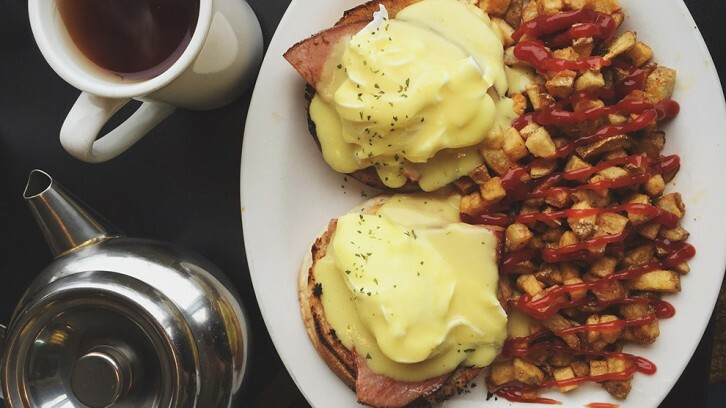 We get our eggs Benedict and breakfast poutine with a sunny side egg on top. Two of the favourites. The prices are good, the hollandaise is tangy, and the coffee is hot.